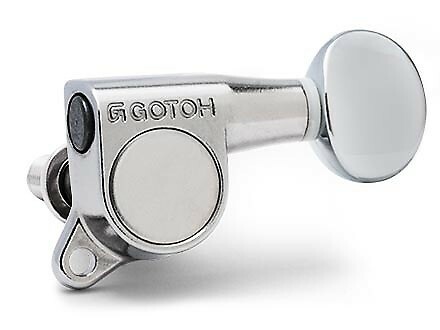 I also ordered these tuners. Anyone know for sure if they are a straight swap for the normal Squier ones? They look like they would be the same. It was asked on another forum, so I checked. The guard matches AVRI almost exactly. 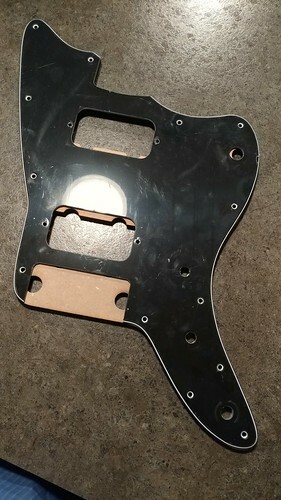 Here it is on one of the templates I bought for a Jazzmaster. Only thing that is off is the toggle hole slightly. Thanks for the pics. Your neck is looking great! 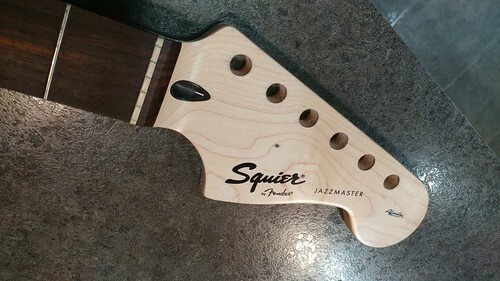 It's nice to know that Squier is using pickguards that can be replaced with very little work. That's going to look excellent with a white pickguard. 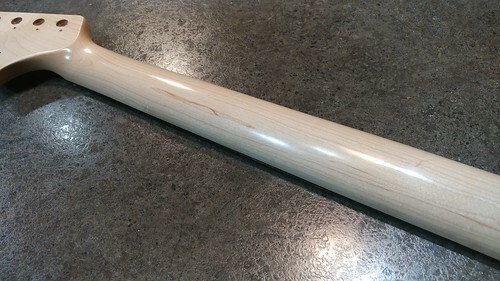 As far as the Gotohs fitting, the most common issue/consideration you have to be aware of is the fit of the bushings (different sizes for US and imports) but your drawing shows it uses a 10mm Hex bushing with a passthrough that accommodates a post measuring .236 (5.99mm) so you should be able to leave the stock bushings in and the Gotoh tuners should just drop in and fit fine. If for some reason they don't fit, you can get adapter bushings but it looks like the stock machines on your Affinity are identical to the Bullet Mustang's so you should be fine. I had to use different bushings when I upgraded my Bullet Mustang to the vintage style Klusons. what bushings did you use? 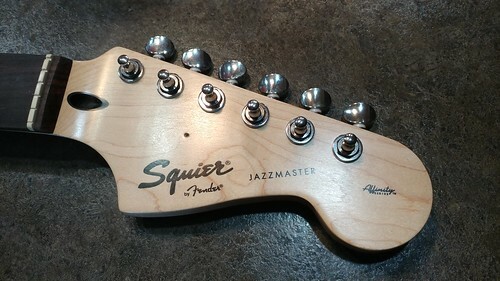 I'm thinking about replacing those Gotohs on my jazzstang with F style machines, and i have those giant squier holes with the plastic bushing in my headstock. 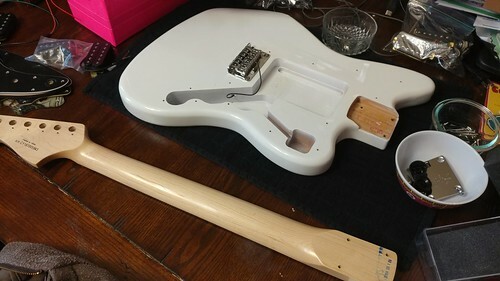 the guitar will look awesome white on white. Those look pretty cool. Do they just stay on the pickup with pressure? Thanks! The actual color is Squier's version of Butterscotch Blonde. 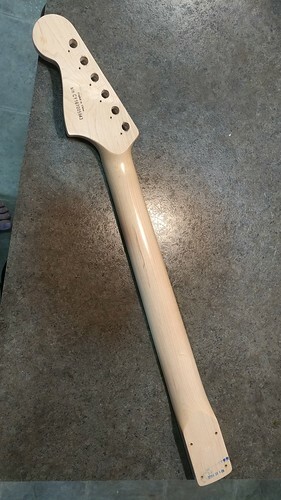 Neck is done. Just waiting for the tuners and string tree to arrive. I also picked up my other parts. Just waiting on a quote for a new pickguard. That will probably be what takes the longest for this to be done. You can see the stain better when it is next to white. I tried one of these at the guitar show yesterday. It looks quite cool, and didn't sound too bad through a Mustang I amp, but I hate these affinity necks. They're a really flat and wide D-shape and so bloody uncomfortable. It's kinda painful to wrap your fingers around, and there's no neck to fill your palm. Actually kinda odd. The Fender modern-C is/was much maligned, but that's wonderful compared to these Squier necks. Good news bad news. The tuners came and they fit, but the hole for putting in the screw has them tilted the opposite direction tuners normally go. 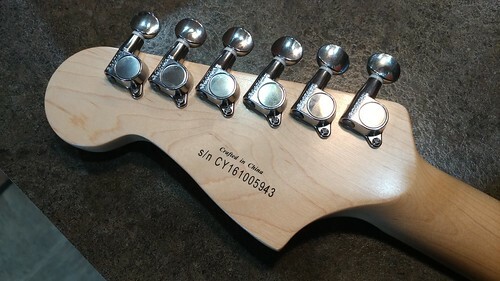 They basically sit perpendicular to the neck instead of perpendicular to the headstock line. They will work fine and I would rather not drill another hole, but I figured I would mention it. I wouldn't have noticed if I wasn't looking for it. when i put them in my supersonic i had to shave a little off the pickguard holes, then jam the cover over the pickup thru the hole, after the pickup is mounted. Cool. I might give them a try. I read someone else say to put some double stick tape between the poles on the plastic part to help hold it down. Ordered a set. Since I am having a white guard made, I just asked the dude to make the pickup holes sized for covered pickups. Hopefully that works.